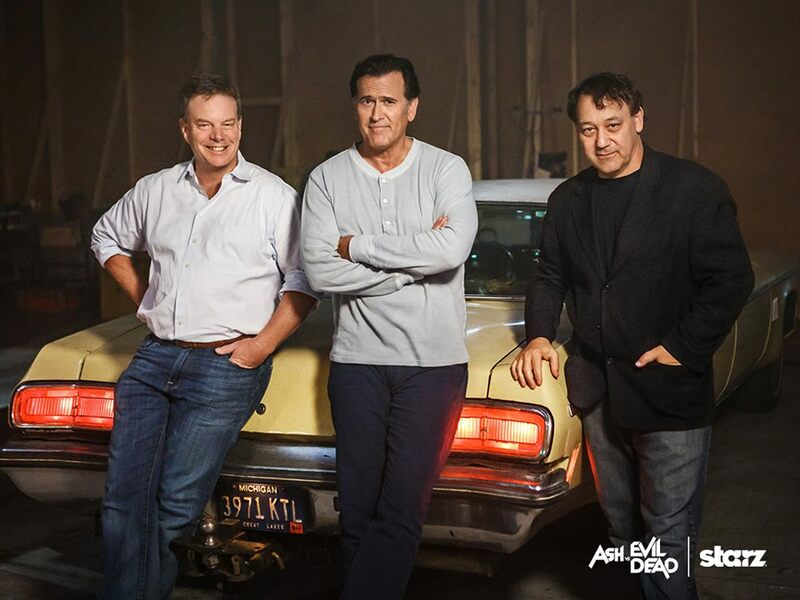 Evil Dead News - News Related To The Evil Dead Franchise: [Interview] Sam Raimi, Robert Tapert and Bruce Campbell On “Ash vs Evil Dead”! [Interview] Sam Raimi, Robert Tapert and Bruce Campbell On “Ash vs Evil Dead”! This morning Starz announced the start of production on “Ash vs Evil Dead”, a new television series based on Sam Raimi’s The Evil Dead franchise. And while the full details can be found here, Bloody Disgusting joined a roundtable – with Raimi, Robert Tapert and Bruce Campbell – to discuss the inagural 10-episode season that brings Campbell back as the beloved Ashley J. Williams, the aging lothario and chainsaw-handed monster hunter who has spent the last 30 years avoiding responsibility, maturity and the terrors of the Evil Dead. When a Deadite plague threatens to destroy all of mankind, Ash is finally forced to face his demons – personal and literal. “Ash is going to making friends and enemies on this show,” teased Raimi. Tapert went into detail: “This incarnation has a team that forms around him, Pablo [Simon Bolivar (Ray Santiago)], a young immigrant who wants to be part of the American fabric and forget his roots – and through his encounters with Ash discovers what’s important to him. The episodes will be 30-minutes long, which came as a surprise. Raimi expressed his excitement about this as it allows them to push the pacing up a notch. “I really appreciate that Starz let us keep the half-hour idea,” said Raimi. “It’s really cool to me [because] we could really fire on a cylinders, be outrageous and fast-paced and nonstop without a lot of secondary character expositions.” There’s literally no padding, he says.